Double your video input options with the Shinobi SDI 5" 3G-SDI & 4K HDMI Pro Monitor from Atomos. The flexible Shinobi SDI is on-camera monitor with both 3G-SDI and HDMI inputs, supporting up to DCI 2K via SDI or up to DCI 4K via its HDMI input. It features a 10-bit (8+2 FRC) IPS screen with a brightness of 1000 cd/m², suiting it for use in both exterior and interior conditions. The Shinobi SDI's AtomHDR display technology enables you to accurately monitor your log gamma footage without having to view flat, washed-out looking images or use a LUT to compress the dynamic range and color space. The monitor supports popular log formats from Sony, Canon, Panasonic, ARRI, RED, and JVC cameras. Preview SDR or HDR LUTs in real time and choose from up to eight custom LUTs loaded in via the SD card slot. Built to withstand the rigors of production, the Shinobi SDI features a lightweight plastic chassis and can be powered from either a single L-series battery or via the included AC adapter. Additional features include the AtomOS 10 platform with a variety of onscreen exposure analysis, framing, and focus assist tools, as well as anamorphic de-squeeze. Choose between monitoring up to DCI or UHD 4K footage via HDMI, or up to DCI 2K via the 3G-SDI input. Input/output audio via HDMI or 3G-SDI and output audio using the 3.5mm headphone port for convenient audio monitoring. 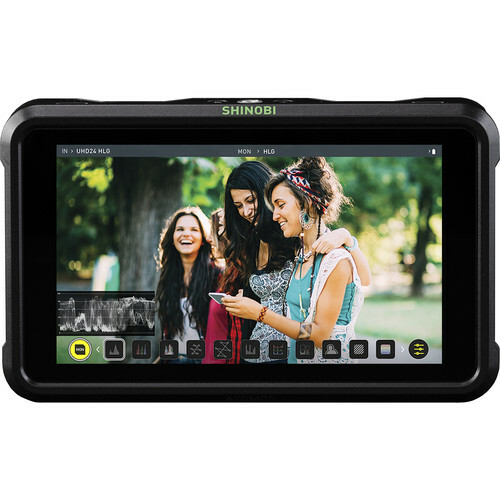 The Shinobi SDI features a 5.2" IPS LCD screen that is illuminated by a bright 1000 cd/m² LED backlight, making it possible to view in daylight without requiring a hood. Plus, the screen is also color-calibrated from the factory to ensure accurate image representation. Log and HDR signals can be difficult to monitor with conventional equipment. With the Shinobi SDI's built-in HDR signal management functions, the log signal can be converted to the PQ standard for compatibility with existing consumer and professional HDR equipment. The AtomOS 10 platform offers an extensive selection of display tools including focus peaking, 4:1, 2:1, 1:1 zoom, zebra, false color, frame guides, SMPTE safe area, waveform, histogram, RGB parade, vectorscope, 2x, 1.5x, and 1.33x anamorphic de-squeeze, multiview 'Analysis' mode, and more. Box Dimensions (LxWxH) 7.85 x 5.75 x 3.45"